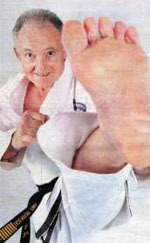 Pacific Sun Taekwondo is a subsidiary of Pacific International Taekwondo, led by 8th Dan Black Belt, Grand Master J.T. Dicks. 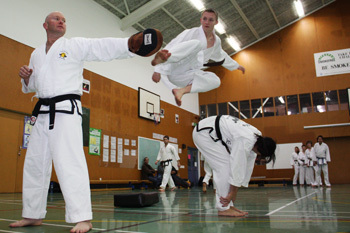 Pacific Sun Taekwondo is not just another martial arts school or exercise studio. While our classes include all the dynamic techniques you expect from a martial art, together with practical self defence skills and fitness training, we offer much more than that. Our aim is to help you enjoy learning the Art of Taekwondo and develop a strong sense of discipline, which we believe is the key to achieving in all areas of life. Taekwondo offers many physical benefits, yet it needs to be part of a structured program for it to be genuinely effective. Our approach is about focussed, committed training. Any punching, kicking or sparring is done with purpose. We work towards each individual’s ability level – and enjoy watching competency and fitness levels grow. Whatever our age, child or adult there’s no question our confidence levels soar when we achieve what we set out to. This sense of accomplishment has a positive effect on our success and happiness. Your body and mind are your greatest tools in achieving what you want out of life. Sounds simple enough, but like anything worthwhile – it takes commitment and discipline. Whether you want to get in shape, do better at school, achieve greater success in your work life or achieve your Black Belt, Pacific Sun Taekwondo provides the experience, expertise and friendly, supportive environment to help realise your goals. Pacific Sun Taekwondo maintains the fundamental tenets of Taekwondo, such as focus, commitment, respect and of course discipline. Our program combines strong effective training with heaps of encouragement, enjoyment and plenty of positive reinforcement. An 8th Dan Grandmaster, appointed as the Regional Director for the World Taekwondo Alliance for Australia, NZ, and the South Pacific Area by Grandmaster Han Min Kyo 9th Dan. He gets the best from students with old school methods, discipline – and plenty of fun and conducts grading exams for members across Australia and New Zealand. An enthusiastic martial art master with over 40 years of teaching Taekwondo, Trevor lives to inspire members to greater and greater heights of fitness and health. It’s not all about the physical aspect though. Years of taekwondo experience have taught Trevor to value the mental health rewards: confidence, resilience, discipline and resolute self-belief.